Available With Option Of Wooden/plastic/metal Pallet Base. 1000 ltr Square Plastic Water Tanks (Flow Bin/IBC/Intermediate Bulk Container/utility tank/chemical tank/Mini bulk containers) in galvanized steel/metal cage. Keeping in mind ever-evolving requirements of our respected clients, we are offering a premium quality range of Reconditioned IBC tank. 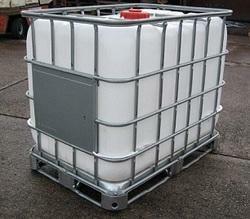 Our company holds vast experience in this domain and is involved in offering IBC Chemical Storage Tank.